Read the first story in this exciting YA series by best-selling author, Jennifer Chambers. Shy, introverted Anna lives for books. She just didn’t know that she would have to actually live IN one. 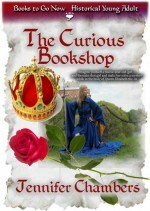 And Anna certainly has a hard time when she has to solve a mystery while in the body of Queen Elizabeth the First.